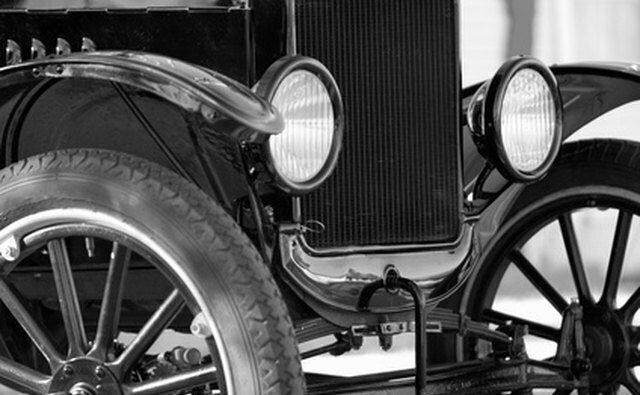 During the 1980s, most manufacturers stopped making car headlights out of glass. 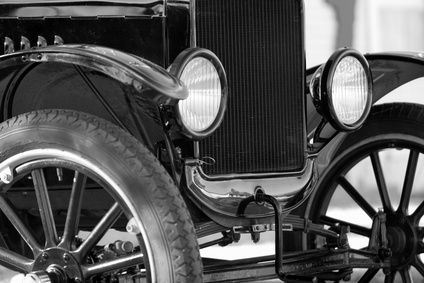 They began using polycarbonate or plastic for the lenses because of the many different car designs with various headlight shapes. Polycarbonate is very light and can be easily transformed into an unlimited variety of shapes, and it's more durable and doesn't break easily. Despite its versatility, polycarbonate is prone to oxidation, which is caused by several different factors. 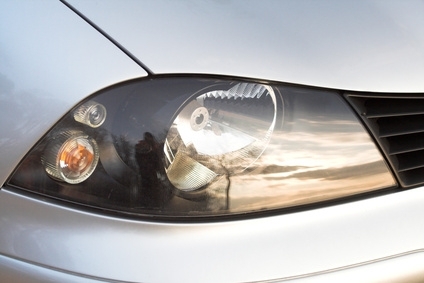 Oxidized, yellow, hazy headlights give poor illumination for the driver and are difficult for others to see. Oxidation of the polycarbonate headlight causes it to become cloudy or take on a yellowish tinge. Ultraviolet (UV) rays from the sun cause the lens to develop micro-cracks, hastening the color change. The top layer of oxidized plastic and cracks can be removed with fine sandpaper, starting with a coarse grit and working through to the finest until there are no visible scratches. Follow with rubbing compound firmly applied to the lens, then polish well. The polycarbonate lens is porous and heats up from the light inside as well as from the sun. It absorbs minute particles of dust and tiny particles through tiny weaknesses in its surface, contributing to its cloudiness. When a bright light is coming out of this semi-transparent lens, it is refracted from these particles and creates a major glare for oncoming drivers. Fine rocks and gravel pit the surface of the lens, contributing to the development of cloudiness. If pitting is not severe, regular toothpaste, not a gel, can be rubbed firmly over the lens. Toothpaste contains tiny abrasive particles that are helpful in removing the film. Rinse well and polish the headlight with polishing compound. Road dirt and mud quickly coats the headlight lens and, during winter, highway de-icer, magnesium chloride and salt rapidly build up, causing a cloudy film. This decreases the driver's visibility and creates glare for oncoming motorists. A fine spray of cooking oil helps loosen dirt and film. Spray, then wash well with strong detergent and rinse. This treatment only works on lights that are not badly pitted or cracked. Nail polish remover can remove film that may remain after layers of road grime have been scrubbed off. Apply to lens with a towel and rub vigorously until the towel is dry, then reapply. Follow with an application of car polish compound. EPA cites studies of damage to automotive paints, coatings and headlights from acid rain. 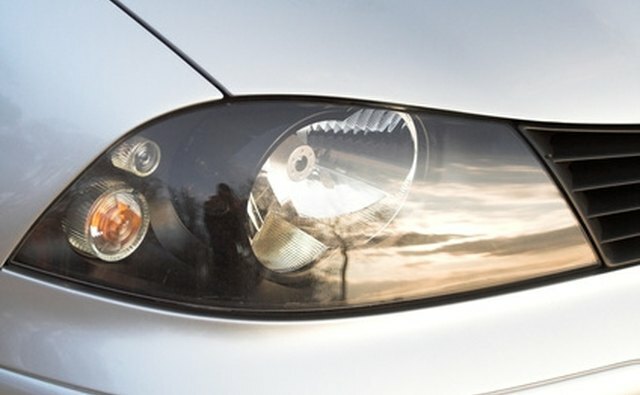 Consumer Research Magazine reported studies of acid rain's degradation of finishes applied to auto surfaces and headlights. Chemical pollutants in the air react with water vapor and oxidants, and sulfuric and nitric acids result. These acid compounds fall to earth in rain or snow. 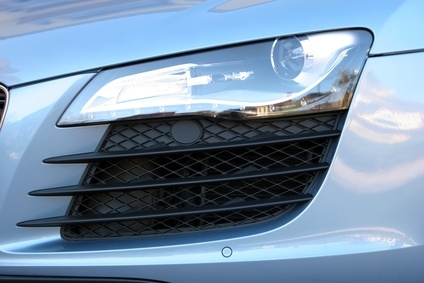 These dry pollutants on a car's surface mix with rain or moisture as in a car wash, causing damage to finishes and headlights.The National Acid Precipitation Program reports a breakdown of polycarbonates in auto and headlight finishes from acid rain. Acid rain etches a distinctive wear pattern into car or headlight surfaces, creating cloudiness and blotches.